I’ve found a rather nutty Mojito song by Spanish singer Gio: ‘I’m drinking my mojito because it is so rico… ‘ Not my usual kind of music but he’s kind of funny and cheerful! The last line is ‘I need a sofa’. So let’s all salsa round the kitchen and shake our hips with a mojito in hand (just testing the ingredients) then start baking! These babajitos were inspired by a recipe in the Fou de Pâtisserie magazine #7 and various other sources. They’re simplified and I’ve played around with different ingredients, quantities and methods. The whipped cream is sugar-free plus the syrup and savarin dough are both sweetened with honey. 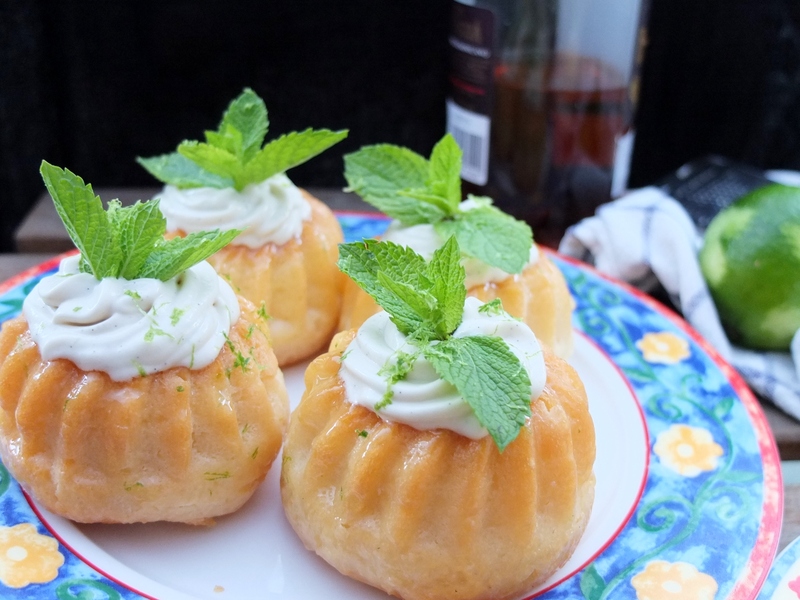 Whipped cream – 10 mins work (infuse 4 to 24 hours); Savarin dough – 20-25 mins, resting/rising 1 and a half hours, baking 15-20 mins; Mojito imbibing syrup – 5 mins (infuse a few hours); Assembly – 10-15 mins. In total – a stretch of 3-4 hours required: 45-55 mins work with around 2 to 3 hours’ time needed for rising/baking/cooling. Babajitos no. 2 timings (with your reserved batch of frozen savarin dough): 30 mins work plus 15-20 mins baking! 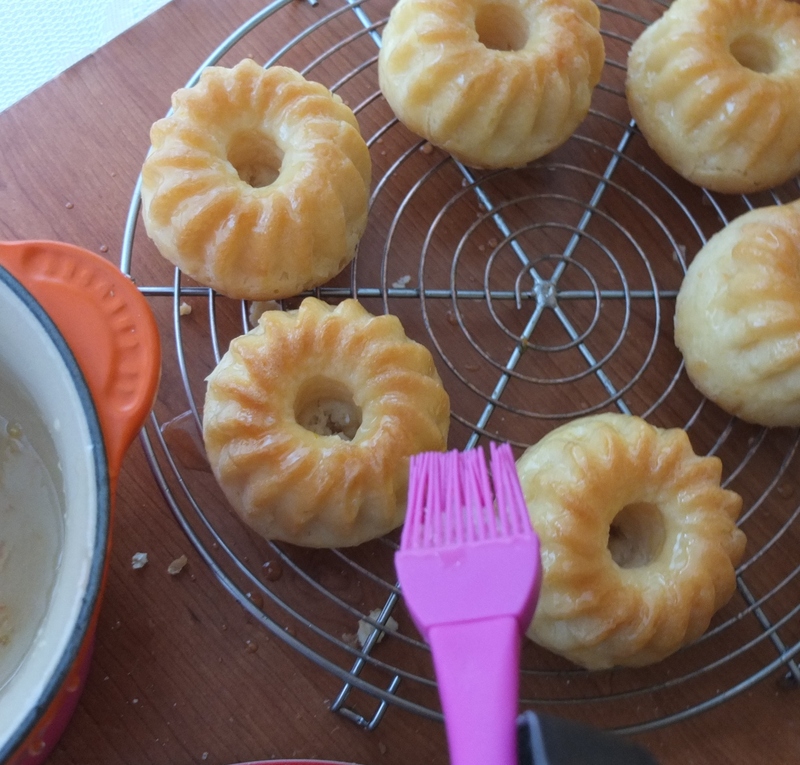 8 small baba or bundt moulds, or 1 big one. A standmixer with a paddle attachment. Disposable piping bags with a plain medium nozzle and one for cream swirls. Whipped mint-infused cream – just enough to fill 8 small babas, but you can make extra to serve on the side. Bring the cream and vanilla to the boil. Stir in the mint and allow to infuse 4 to 24 hours, storing in the fridge to cool until required. 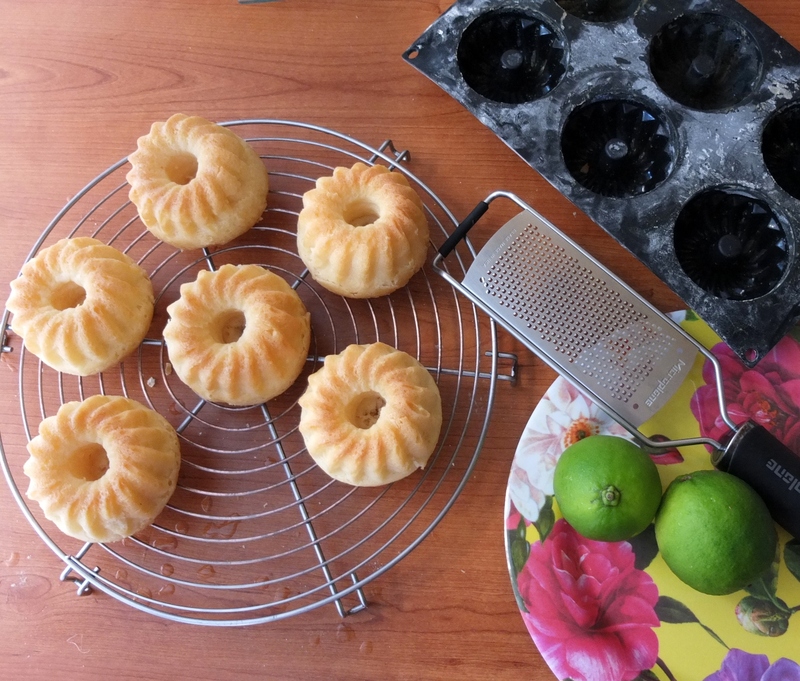 Savarins Preparation: butter and flour your savarin moulds. Baking: bake individual savarins in a preheated oven at 200°C/400°F (static, non-convection oven) or 180°C/350°F (fan-assisted) for 15 to 20 mins. Bake a big savarin at 180°C/350°F (static, non-convection oven) or 160°C/320°F (fan-assisted) for 30-40 mins. 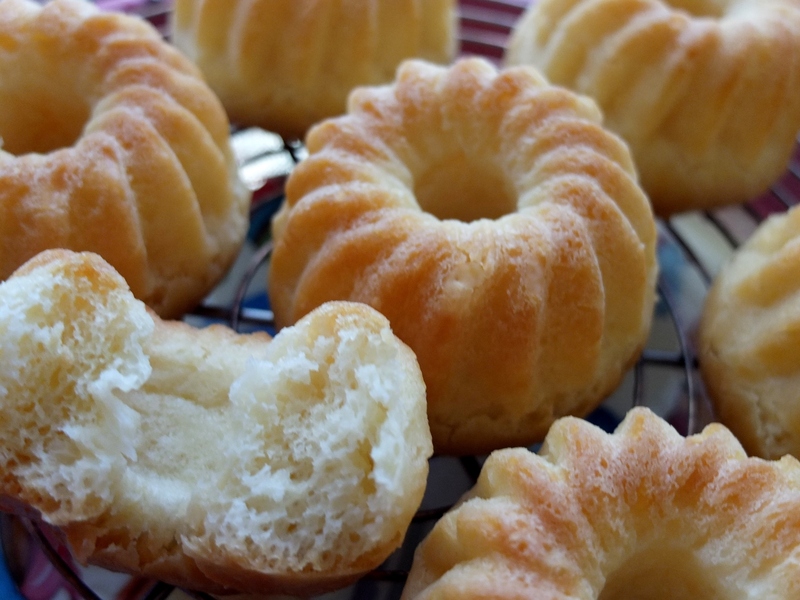 Follow the instructions on my savarin dough page. Alternatively, use your own trusty recipe. You need to make this kind of quantity (then only use half) because it’s tricky to make smaller batches. You can prepare the syrup while your savarin dough is rising. Bring the water, lime juice and honey to the boil then take off the heat. Stir in the mint leaves and leave to infuse. When just warm, stir in half the rum then allow to infuse at room temperature for an hour or more. Just before assembly pass the syrup through a sieve and squash the mint with a metal spoon to extract all the liquid. Then stir in the other half of the rum. Warm up your mojito syrup till fairly hot (around 48°C/120°F) but not very. Place the wire rack with the savarins over a tray to catch the dripping syrup. 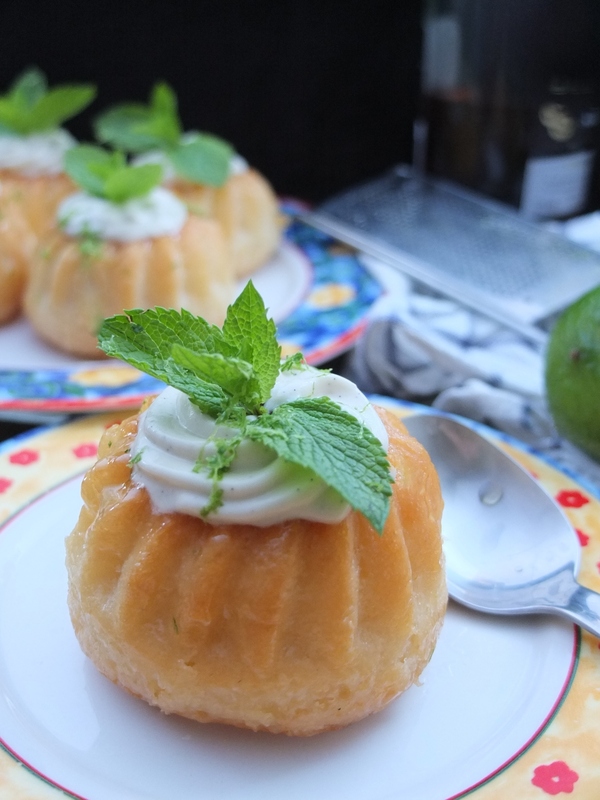 Soak one savarin completely in your small bowl of mojito syrup for 30 seconds, then turn upside down and soak another 30 seconds (1 minute in total). Repeat the process for all the savarins. Repeat stage 2 so the savarins have all been completely soaked for a total of 2 minutes each. 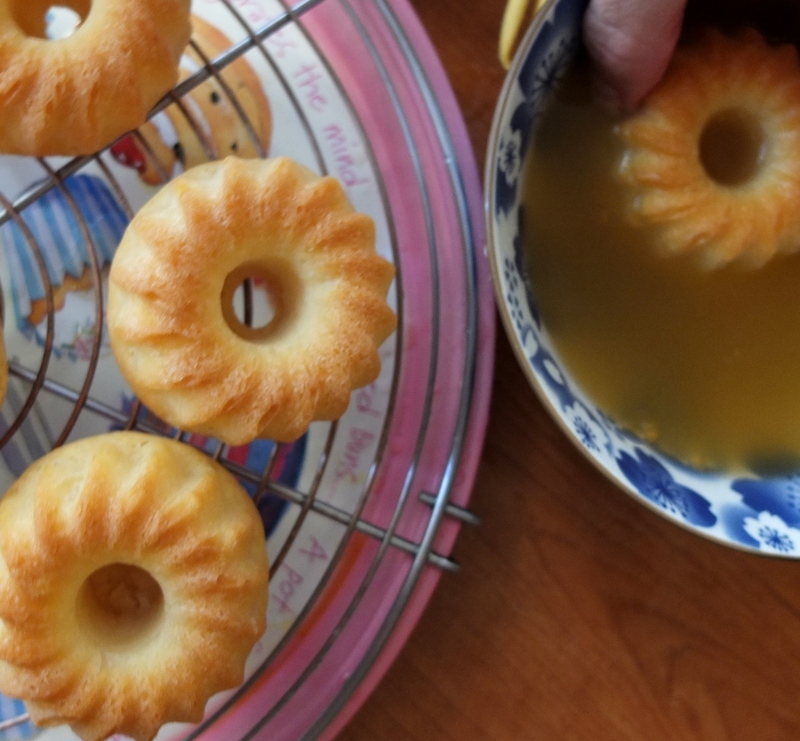 When the level of syrup starts going down, compensate by brushing syrup over any uncovered parts of the savarin. If there’s some syrup left in the bowl turn the savarins on their sides and quickly roll them in it to soak up the remaining syrup. The savarins need to soak the syrup up like sponges till they’re heavy and completely moist. But they shouldn’t fall apart. Place carefully back on the wire rack. Gather up any syrup caught in the tray underneath and brush the savarins with it. Warm up two tablespoons of apricot jam over low heat with a tablespoon of water. Brush the savarins with the apricot jam glaze so they glisten. Whip the reserved mint-infused cream to stiff peak. Place the babas on their serving plate(s) and pipe cream into each baba hole, finishing with a swirl on top. When you’re ready to serve, grate some lime zest over your babas and top with nice mint leaf bouquets. You can add any extra cream on the side. 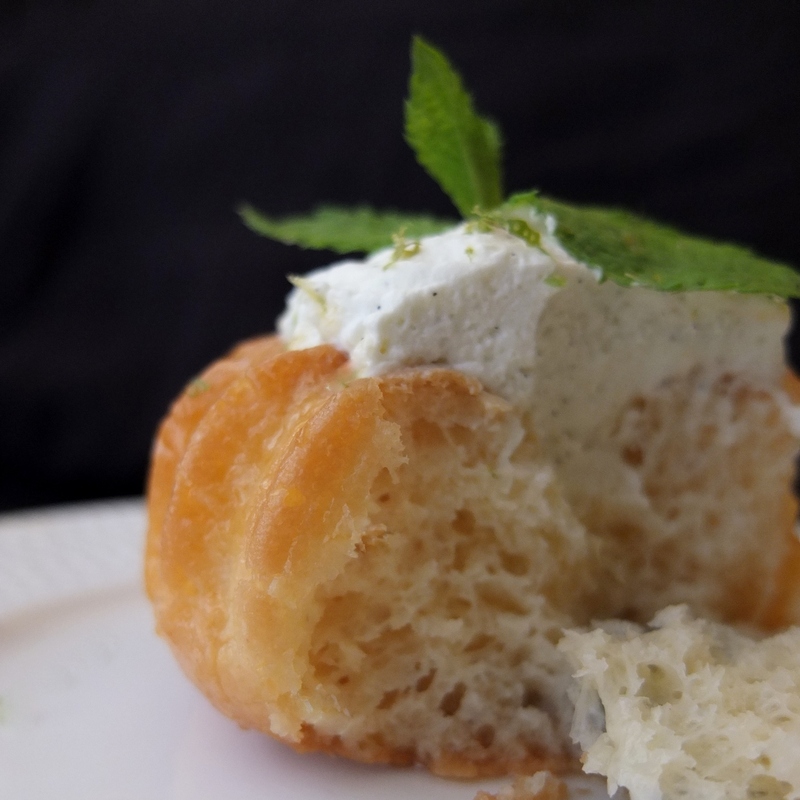 Variations (all topped with vanilla whipped cream) – Classic rum baba: omit the lime and mint but add vanilla to the syrup. Top with a glacé cherry. You can serve with chopped fruit such as pineapple soaked in remaining rum syrup. Kirsch savarins: imbibed with kirsch cherry liqueur syrup (with orange and lemon zest) and filled with cherry compote. These babas keep really well up to 3 or 4 days in the fridge in airtight tupperware. I think the alcohol helps. 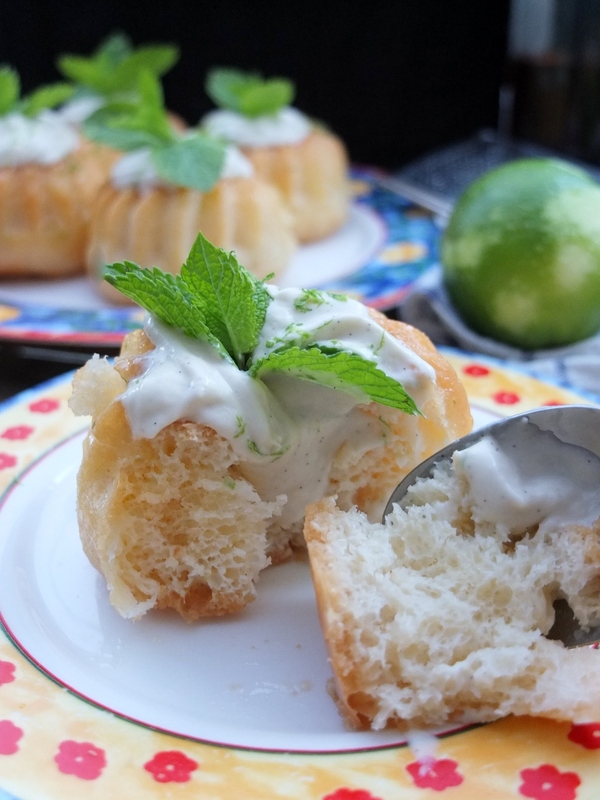 You can also store the whipped cream separately and add with the lime zest and mint leaves just before serving. According to legend, in the early 18th century the exiled king of Poland, Stanislas Leszczynska, found kugelhopfs too dry and started dipping the bread in Tokay wine to moisten it. Some even say he was so chuffed with this invention he named it after Ali Baba, a hero from his favourite book A Thousand and One Nights. The dessert underwent some changes, with Parisian pâtissier Stohrer replacing the wine with rum in 1835 and with the use of a brioche dough. 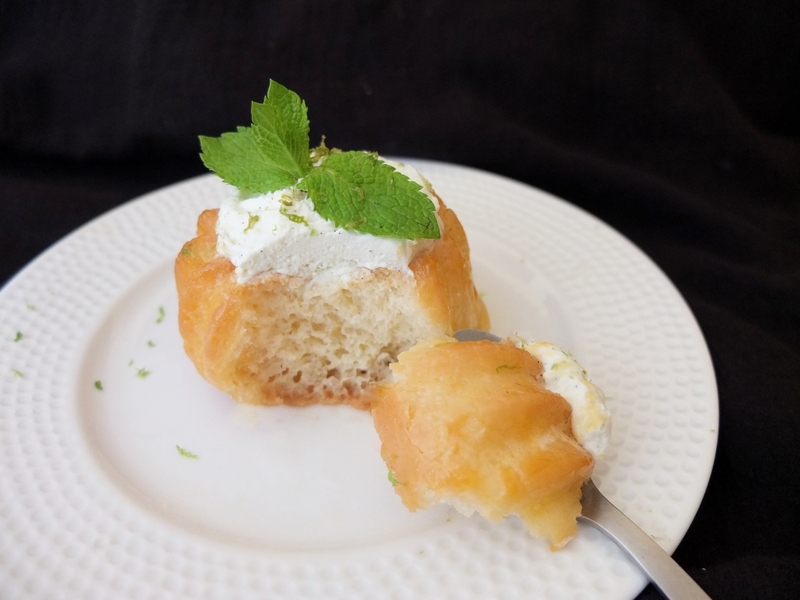 This Baba au Rhum became very popular in France and is often served at special occasions. 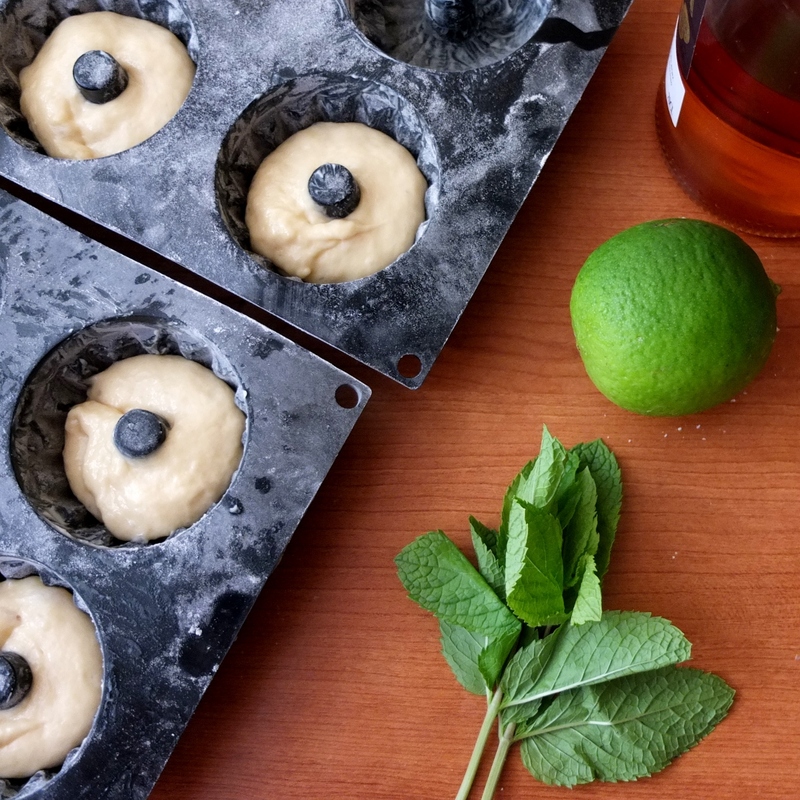 So I hope you’ll enjoy this modern cocktail version: Mojito babas or babajitos. It’s the kind of eye-popping celebratory dessert that says ‘let’s party’ and it’s so light and moist you might easily down two or more in one sitting. Olé! Rum babas were one of the few desserts I didn’t get to try while in Paris this year, and now I’m regretting it! I may have to make some of my own with your fabulous recipe! Ohhhh I have been waiting for you to post this! Divine!!!! Save me a few! I’ll be right over, and I’ll have #1 Grandson’s too. 🙂 I wish! The imaging is lovely. The colors are fresh, and the clarity is tops. Well done on all counts!